Have Pets? Get the best for your best friends. Chances are you consider your pets to be part of the family. And just like everyone else in the family, they can have sick days. Although your employer probably will not let you list a pet as a dependent on your health insurance, there are coverage options available for your fur babies. Comprehensive pet health and accident insurance helps provide coverage for veterinary care from routine checkups to emergency services and alternative therapies. You have the freedom to choose various levels of coverage and flexible plans. This helps to alleviate any financial stress when choosing the best available veterinary care for your pet. 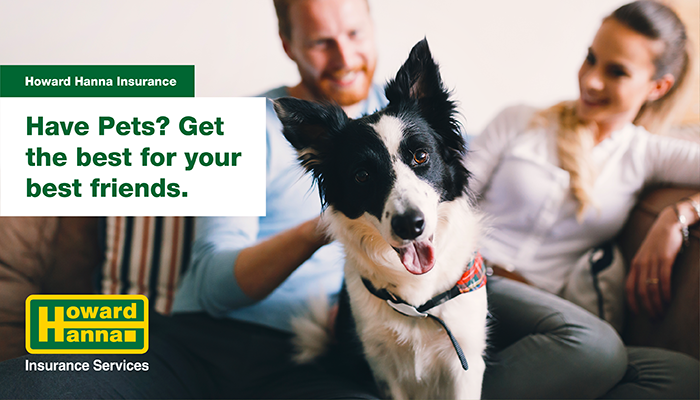 Howard Hanna Insurance Services wants to provide you with all the information and coverage options you need to keep your family happy and healthy – including your pets! Quote for pet insurance ?? How do I get a quote for pet insurance? Hi, Suzy! Head to https://www.howardhanna.com/Insurance/Contact to connect with someone! I would be interested in getting a quote but according to others, there is no place to proceed to get a quote. Please send details about available coverages.